What was the money or product used for? 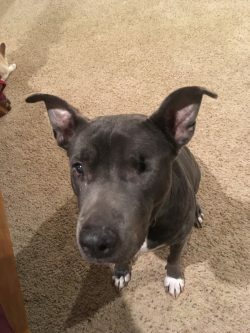 The $119.13 received from the Petfinder Foundation was used to pay for medical care for Blue, an older female blue pit-bull mix: the surgical removal of her left eye and the removal of a large, low-hanging mammary tumor. All funds went to those surgeries (done at once) and were not used for anything else, including routine maintenance. How did this grant help your organization and the pets in your care? This organization helped Blue become adoptable and healthy. Blue came in as a stray with a variety of health problems that clearly had gone untreated for years. Without the removal of her eye and tumor, she would have continued suffering. Without these surgeries, adoption would have been less likely and she would have been in great pain and misery. How many pets did this grant help? Please provide a story of one or more specific pets this grant helped. This grant helped Blue become adoptable and the surgeries, as previously noted, helped eased her pain and suffering. 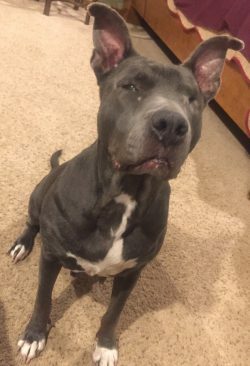 Blue came in as a stray found within the City of Larned in November of 2018. 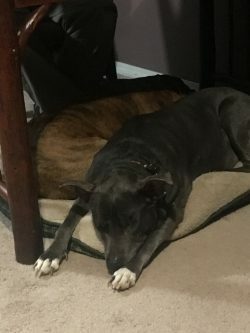 This was the second time during 2018 that the dog had been found as a stray. The owner had obviously neglected to give Blue proper medical care. Her left eye was bulging out of its socket and was pink. Blue clearly had had a lot of puppies during her life and she also had several mammary tumors, one of which was hanging down pretty far on the left side of the front of her chest. The owner claimed that she was born with both of those conditions and that the vets in Pawnee County had confirmed that. Upon further investigation and discussions with the vets in Pawnee County, this was determined to be false. The dog had not been to the vet for most of her life, if at all. 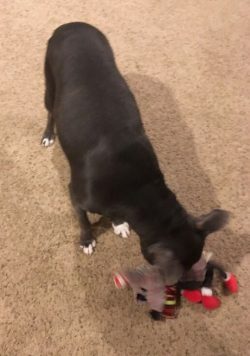 Dr. Burdett at Larned Vet Clinic told us that Blue was between 8 and 10 years old based on her teeth (which were pretty bad and likely make her appear older than she really is), and said he could remove the big hanging tumor as well as her eye. She was in otherwise good health, happy, heartworm-negative, and friendly to other dogs, cats, and people. The owner did not claim the dog within three days, never called or made any arrangements to get her, and despite her health issues, we determined that she was a good dog worth keeping and adopting out. Although she is a senior dog, she walks and runs really well for a dog who is supposedly 8 years old, and has adjusted to having on one eye. She is now spayed and vaccinated. Blue is currently in a foster home with four other dogs. Blue has done well in that home with all of the foster’s other dogs. It is difficult to determine, in a shelter environment, how an animal will act in a home. Given that Blue is an older pit-bull mix with one eye, her length of stay was going to be longer anyway. Having her in a foster home has helped us find out more information about her that may not have been known otherwise. We found out that she is housebroken and kennel-trained. She does well with cats, too. Had she not been fostered, we would not have known these traits. Although she has yet to be adopted, the foster works with a few people who are interested in her. She has gone on a few meet-and-greets with others and hopefully she will be adopted soon. Blue is a wonderful dog and, despite her estimated age of eight years old, she is still quite active and playful. She is a really great dog and PCHS is grateful for the medical grant, which helped us offset the costs of her lifesaving surgeries. Meet Blue here.